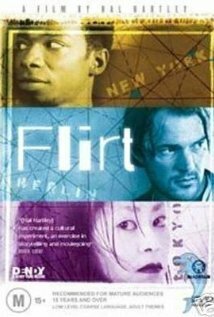 Spanning three continents, three languages, three races, two sexual lifestyles, “Flirt” is a look at misunderstandings. In each situation a lover has to decide whether to commit to a partner who is coming home. In New York City we meet Bill (Bill Sage) and his girlfriend (Parker Posey) who gives him an ultimatum to make a commitment to the relationship or end what they have. She is then on her way to Paris. In Berlin, we meet Dwight (Dwight Ewell) a young African American who can’t settle down with Johan, an art dealer who is older than he is. In Tokyo, we meet Miho (Miho Nikaidoh) who is in love with two men—her teacher, Mr. Ozu (Toshizo Fugiwara) and an American filmmaker. The movie looks at love as it moves (or doesn’t move) into relationships and it tells it three times. In watching the film, we get a look at issues of sexual orientation and. class identity. In each city, the dialogue is identical and the plot is about violence and the results of flirting and desiring what is not readily available. There are some differences that we notice and these are because of sexual orientation, setting and culture. To a degree this is a film about human behavior and we see that we are more or less the same even if we are not willing to freely admit it. A certain action can bring the same reaction from all of us and this is what I see as the point of this film. Hal Hartley, the director, studies the same situation in three different places which are really not important. What we see here could happen anywhere and we are immediately aware that this is not a conventional film and we really cannot explain why the reaction is the same. Because this is not a typical movie, many do not care for it. Some feel that the dialogue while excellent is two repetitive. However, the film is fun, insightful and well acted and Hartley again shows us that there is nothing mainstream about what he does on film. In each story, a character is about to leave town and asks a new lover if they have a future together and then the new lover asks for time and calls another lover, trying to decide between the two. In each story, three other characters give advice and in each story there is a telephone conversation in which we hear the word “no” several times and in each story there is a shooting and an emergency room scene. This idea of a trilogy of films with the same dialogue is clever and we would think that this is a fun film to watch. Hartley is an evocative director and his humor sets the style of his films. Here we really only get attitude and there is no Hartley vision like he usually gives. This really seems to be something of an experiment but it does not hold up for three films. I am not sure when I realized that Hartley’s idea does not work but I do not find that his observations about life are interesting. I think that when he comments on what he is doing is when it begins to fall apart and his humor turns serious. The idea of three identical stories is brilliant but there is something that causes the idea to break down and that is too bad.